The market is calming down after the UK referendum last week and Pound is recovering again. However Crabb pointed out that there might be another referendum about Brexit. Today GBPUSD left a small bullish candle followed by two pullbacks. The support rests at 1.33500 with resistance at 1.34680 which both lines are below the weekly pivot point at 1.39630. The EMA of 10 is moving horizontally below the EMA of 75. The RSI is still below the 50 level and it is not showing any upward force, the MACD indicator is in negative territory as well and the Stochastic is showing downward momentum. 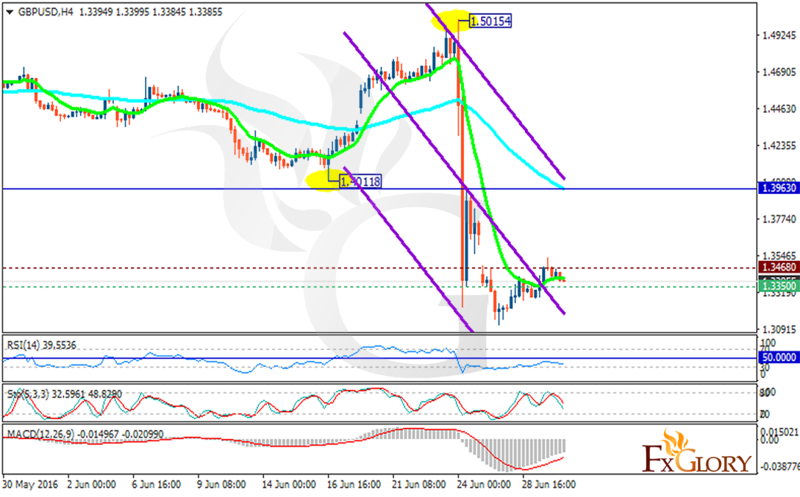 There is a strong resistance around the 1.33 area and it seems that the pair is falling down targeting 1.30 area.